I NEVER EXPECTED SO MUCH SUPPORT FROM YOU! YOU ALWAYS MAKE ME SO HAPPY WITH UR KIND WORDS !!!! AND I PROMISE TO MAKE BETTER STUFF FOR YOU IN THE FUTURE! congratulations to you for your amazing blog! just keep going the wonderful job! 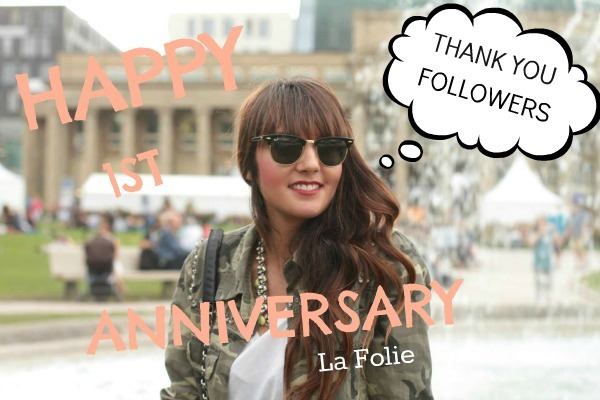 Happy Birthday La Folie, I really enjoy your blog! Du bist meine lieblings Bloggerin! Love your blog <3 <3 Happy blogerversary Shara!!! Congrats!! Happy Birthday to your blog! Super happy one year of blogguing!! My dear you are doing such a great job!! keep going on!! Its very hard to find nice people in the fashion world and you are sure one of those! Im very proud of you!! And congratsss!!! For more and more years of great fashion!! Congratulations! Have a lovely vacation! Gratulation und alles Gute! Bist eine hübsche und obwohl man dich nicht persönlich kennt, wirkst du sehr sympathisch. Auf viele zukünftige Jahre La Folie.